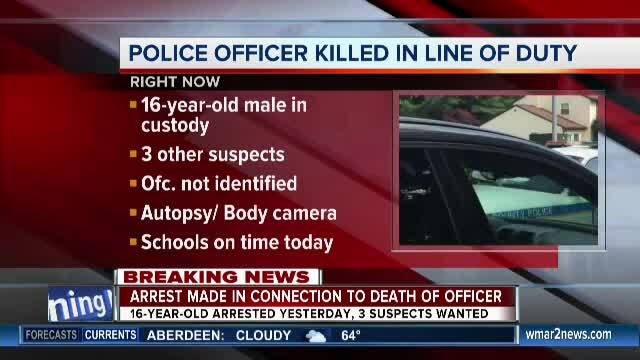 Baltimore County Police say they have four teenage suspects involved in the death of an officer in police custody, and at least one of them is facing murder charges. On Monday around 2 in the afternoon, Officer Amy Caprio was killed in the line of duty while investigating suspicious activity in Perry Hall. She was almost a four-year veteran of the force. 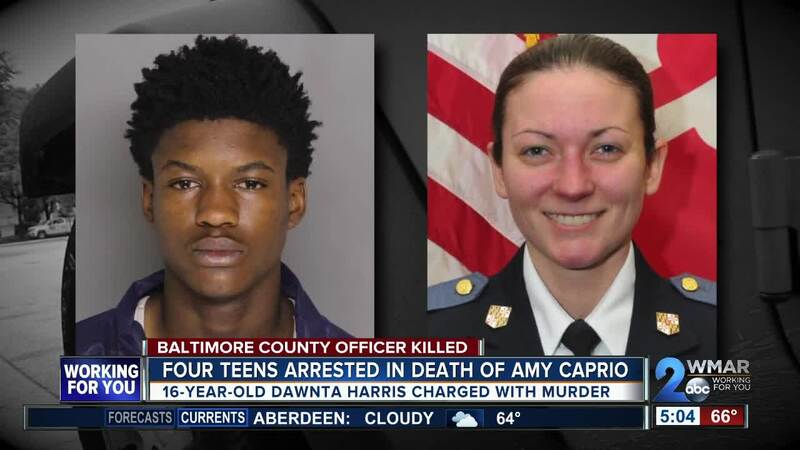 Tuesday morning, police announced that 16-year-old Dawnta Harris was arrested shortly after the death of Officer Caprio. Harris is being held without bail pending his trial on murder. According to charging documents, police were called to 3 Linwen Way after a woman said there was a black Jeep Wrangler near her home, and three suspicious subjects were walking around. The woman stayed on the phone with a dispatcher and said that the three people had broken in and that an officer was on the ground after confronting the driver of the Jeep Wrangler. The charging documents continue to say that Harris admitted that he was waiting in the driver's seat of the Jeep Wrangler while his other associates were burglarizing the house. He then said he tried to drive away in the Wrangler when he saw Officer Caprio arrive in the area. He tried to flee, but Officer Caprio followed him to the cul-de-sac at the end of Linwen Way. Harris has been charged with first-degree murder and he will be charged as an adult. Baltimore County Police say Harris' associates are in custody and they are all teenage boys, all 16 or 17 years old. Detectives have verified the group was involved in burglaries in the area. Prosecutors have not said if they will be charged as adults, or what charges they may face. The state says a handgun was stolen from one of the houses they broke into and has yet to be recovered. The state’s attorney said there is ample body camera footage from Officer Caprio including the moment when Harris opened the Jeep door, looked out at Caprio standing in front of him, then closed the door, and accelerated into the officer killing her. Caprio fired one shot before being hit by the truck. This is not Harris' first run-in with the law. During his bail review, the State Attorney read a litany of juvenile arrests for four separate thefts of cars since December of 2017. They also said he served time in a juvenile community program before skipping on home detention with an ankle bracelet last week, fleeing the Gilmor Homes and stealing the Jeep he would later use to kill Caprio. There did not appear to be any family for Dawnta Harris in the courtroom. It was however, jammed with @BACOPoliceFire Police Officers who at times were emotional as the states attorney read more details of yesterday’s incident. The judge in this case called Harris a "one man crime wave" and doesn't believe any juvenile facility is secure enough to hold him.